The area between London and Reading, in Berkshire, has the highest likelihood of a tornado in the UK, according to researchers mapping their location. The University of Manchester tracked “tornado hotspots” in the UK between 1980 and 2012. 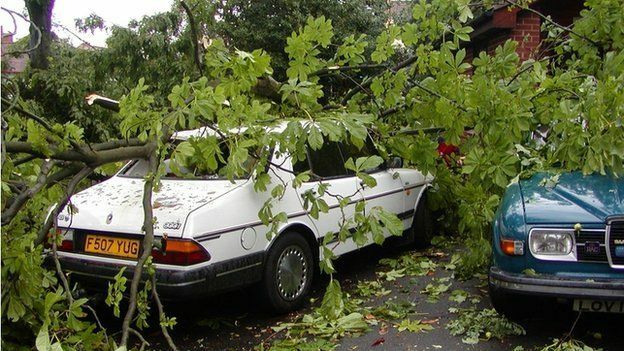 It found that there had been an average of 34 tornadoes in the UK each year – particularly in southern England. But a high proportion of these spinning columns of air had relatively low wind speeds and did not create much damage. The researchers from the University of Manchester have produced a map showing the prevalence of tornadoes. It found they were much more likely in England than in other parts of the UK – and if England was taken separately, it would have one of the world’s highest rates of tornadoes, relative to its size. It found there was a 6% chance of a tornado per year in the area between London and Reading. The researchers say that this means a tornado is likely once every 17 years. There was a 5% likelihood in a zone from Bristol north to Birmingham and Manchester. And there was a 4% likelihood of a tornado between north-east London and Ipswich. But while tornadoes are relatively frequent in the UK, 95% of them are in two lowest categories of strength, classified as F0 or F1, with a maximum wind speed of 112mph. Only one in 20 reaches the level of an F2 tornado, with speeds up to 157mph. 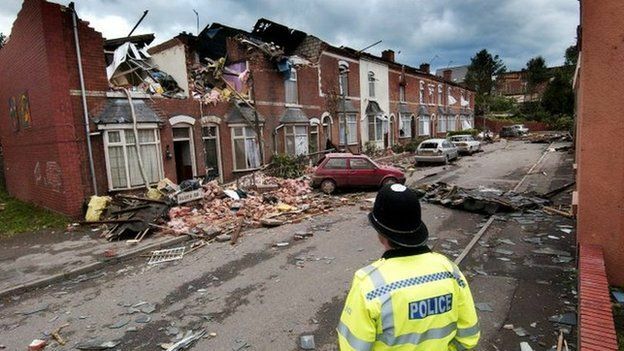 In 2005, an F2 tornado caused 19 injuries and damage costing £40m in Birmingham. The scale goes up to F5, with wind speeds over 300mph, and it is these highly destructive tornadoes that can hit parts of the United States. “Because tornadoes are capable of causing such damage it is important that we have some kind of idea where they are most likely to hit,” said Kelsey Mulder, of the university’s School of Earth, Atmospheric and Environmental Sciences. “It seems that most tornadoes in the UK are created along long, narrow storms that form along cold fronts,” said Ms Mulder. She says there is no simple explanation for why some areas in the UK might be more prone to tornadoes and identification could depend on eye-witness reports. Thunderstorms kick off as Britain is battered by severe weather! Europe bakes at over 40c with the UK at risk of a severe heatwave!